I have a friend in SEO who consistently pumps out posts about strategies to drive “massive traffic” to your blog or website. As any experienced marketer knows, nearly all of this traffic is represented by people who take a quick glance at a link and then never come back again. They are little more than tourists to your site. That’s a nice sound bite, but frankly a lousy marketing strategy. If I presented a marketing strategy based on “hope” to my boss, I would probably be kicked out of the office—and deservedly so. Instead, I would humbly like to present another way to think about actionable marketing strategy by focusing on an area you may not have fully considered before. I recently wrote a book called The Content Code, and for more than a year, I dove deeply into the economic drivers of content and social media. Here’s a statistic that made me pause: 83 percent of CMOs claim that social sharing is the primary benefit of social media marketing. You mean it’s not clicks, followers, or likes? It’s not even traffic, for heaven’s sake? These CMOs are smart people. They know that 70 percent of their customers are more likely to buy something when they see content about a product or service shared by a friend. People who share content are likely to read and understand what you do before they make a decision to share it. In essence, they are becoming your advocates. This forces us to re-consider the real metric that is the best leading indicator of sales: content that moves. Power on the web does not come from content. It comes from social transmission . All this money you’re putting into content development does nothing for you if it is not seen and shared. Content that doesn’t move has the same economic value as an unseen movie script locked in a cold, dark vault. Another deep discussion point in my book is the psychology of sharing. To understand social transmission, we must understand why people decide to share. Because the content serves as an extension of their self-identity (It makes me look cool, relevant, smart, etc.). Because they believe in the person or brand creating the content so much that they want to support them no matter what. These motivations present an extraordinary shock to the way we think about marketing. If the real economic value comes from the transmission of content, and people share content for intrinsic and emotional reasons, why do companies spend so much money to try to get people to share content for economic reasons? Sure, through paid means like SEO, advertising, and promotion, we might be able to trick somebody into viewing a piece of content, but we can’t trick them into sharing it. I interviewed more than 50 experts for this book, and here is the word that came up over and over: “trust.” Emotional ties to content and brands are created by trust. Pretty easy to understand, right? If it makes sense to you, then why are you spending a good portion of your content budget on things that don’t create trust? Shouldn’t that be our laser focus? Now, before you come after me, let me emphasize that there is absolutely, positively a role for SEO and all of these promotional tools in a content marketing plan. In fact, they can be crucial, and I have an entire chapter devoted to it. I want to challenge you: Are you taking the easy way out in your marketing plan? Are you spending money on advertising and SEO because they are easy and familiar? Because you can get the budget approved? Because it’s convenient to outsource to an ad agency (and outsource accountability)? On the other hand, building trust instead of traffic takes time, a new mindset, a new commitment, and perhaps even a leap into the unfamiliar. If your marketing department was singularly focused on the biggest economic driver on the web (increasing the number of people who share your content), how would that transform your strategy? 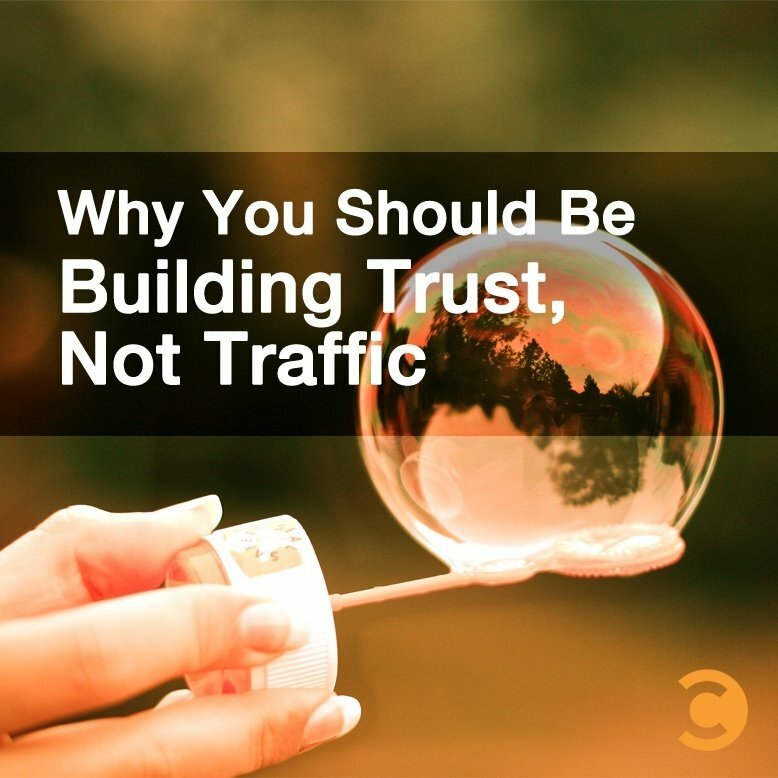 How would you build a strategy based on trust, not traffic?